We've all been there: we're enjoying a nice cob of corn, happily covering our face in butter and salt, when suddenly we realize that there's a thread of corn silk stuck in our teeth. We try to dislodge it with our tongue; no luck. We pick around with our fingers; still no luck. That silk is staying there until you return home to your toothbrush and dental floss. And if you think that corn silk is bad for most people, try having braces! Cutting the kernels off corn on the cob not only helps this problem, but also makes corn a lot easier to cook with. There is a problem, of course. I'd like to think I have above-average knife skills, and yet I'm completely scared to try and cut kernels off corn on the cob. There's no way to balance the oblong cob, and you have to cut straight down. To add insult to injury, the kernels corn go flying everywhere; it's nearly impossible to cut them in a neat and orderly manner. But worry not: there are some surprisingly easy (and safe!) 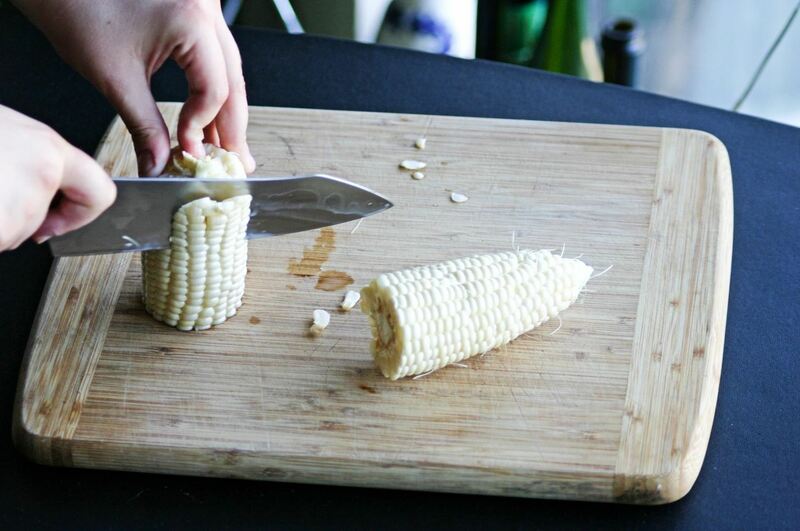 ways to quickly and neatly cut corn off the cob. I only recently found out about this (big thanks to Saveur's amazing video channel), but it's now one of my favorite food hacks. Place one end of the cob in the middle of the pan, which will keep the corn stable while you cut down. Then, as you cut the ears off of the cob, they'll collect in the pan instead of scattering everywhere. If you don't have a bundt or angel food cake pan, you can make your own version. Start with a cake pan, pie dish, or shallow bowl. Then add any stable item that can hold one end of the corn, such as a narrow cup or a shot glass. (My personal favorite is a toilet paper cardboard tube, but please be careful if you try this: these tubes are remarkably flimsy, so if you apply too much pressure they will collapse while you're cutting.) Then proceed just as you would with a bundt or angel food cake pan, until you have a bowl of perfectly cut corn. 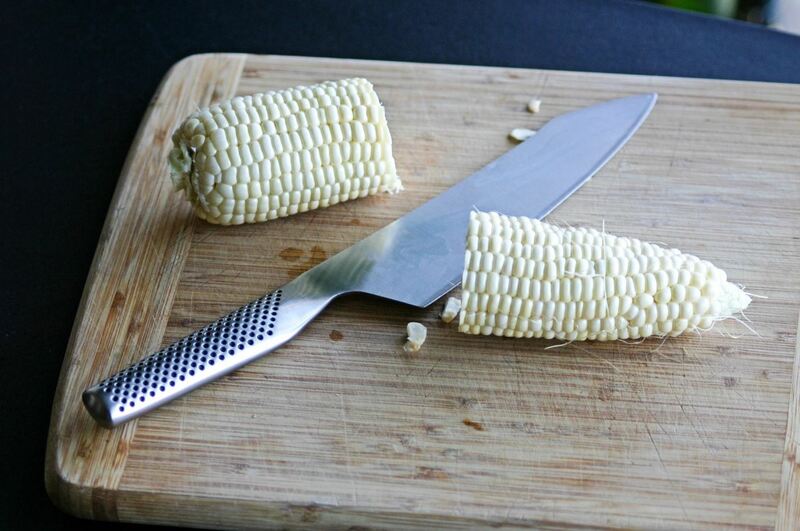 This is the quickest way to get the kernels off of the cob, but you want to avoid it unless you have a nice knife and are comfortable using it. 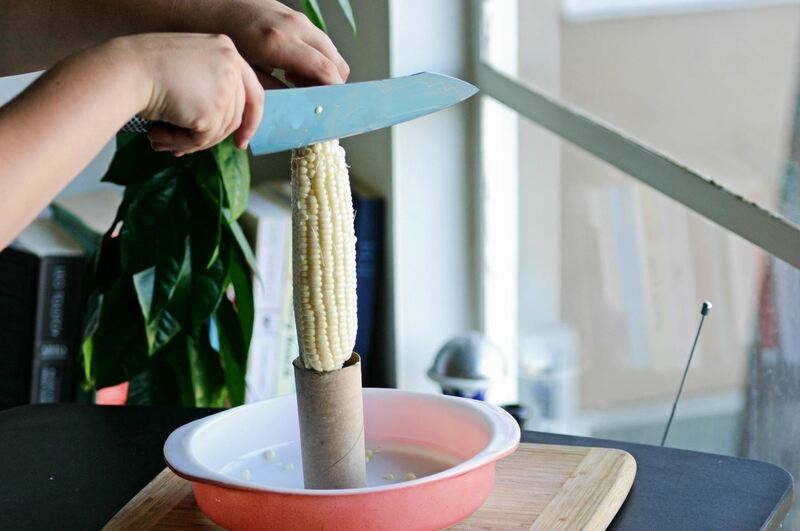 Start by cutting the corn in half, which is harder than it looks: the core of the cob is extremely hard, and the corn will want to roll while you're trying to cut. So above all, be careful! 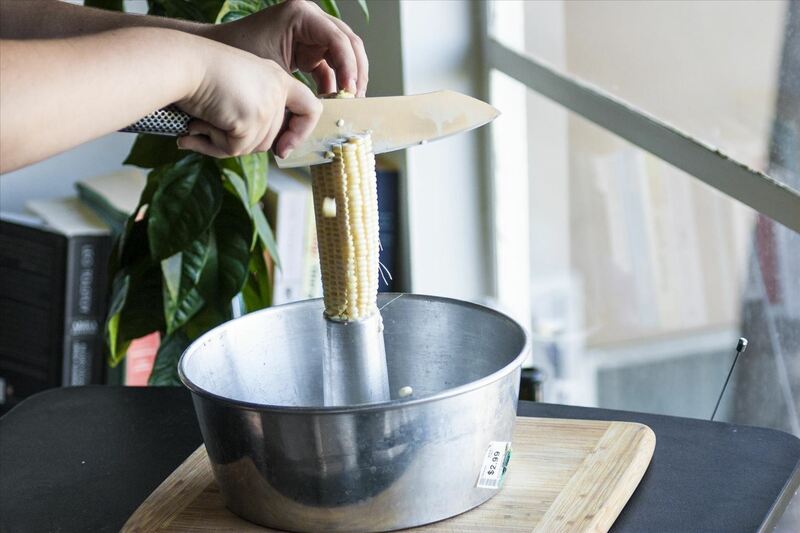 Now that the corn is in half, each piece has a flat side, making it easier and safer to balance the cob while you cut it. And with each piece half the size of a full cob of corn, there's less mess when you cut the ears off. Then again, if you're hell-bent on keeping the corn on the cob, but still want to get rid of the strings of silk, you can always microwave it. Sometimes unflavored dental floss is better at cutting certain foods than your knife—seriously! And if cutting tomatoes befuddles you, be sure to read our indispensable guide on how to do it right. As for mangoes, turns out you need to bring a drinking glass in order to cut them the right way. As a kid I called removed kernels "corn off the cob," vs. "corn on the cob." Now I might call it loose corn, no longer attached to the cob.